August 1988 is a hot summer month. Ofra Haza’s Im Nin’ Alu is the first song that can be called world music to take the #1 spot in the charts. In the Middle East the Gulf War between Iran and Iraq comes to an end, and representatives of Christian churches bemoan the decline and imminent fall of Western civilization. They warn against the new film by American director Martin Scorcese. They claim it is blasphemy that insults both God and men. The Last Temptation Of Christ is based on a novel by Nikos Kazantzakis. It attempts to consistently present Jesus as a man who, though he remains free from sin, like every man is still subject to all forms of temptation. Not all critics were outraged; many enjoyed the film while others described it as an “overly ambitious rendition of the biblical subject matter” and added that “the most interesting thing is the music by Peter Gabriel”. It is up to you to decide whether the movie is wooden, lively, blasphemic or philosophical. One thing is certain, though: Hardly ever has a film had such a sympathetic score. The soundtrack was supposed to hit the stores when the film opened. While a flood of indignation against the movie raged mainly through the US, the entry “Peter Gabriel – Passion” disappeared from Geffen Record’s release list. Did the company bow to Christian fanatics? No, there was a different reason: Gabriel had written the soundtrack early in 1988; six weeks had been allotted for its recording. Universal wanted to release the controversial film as soon as possible, and cut Gabriel’s time for recording and mixing to three weeks. Where the recordings for the film were a “bit of a rush” Gabriel wanted to fine-tune the sound track. His involvement with the Human Rights Now! tour for Amnesty International, however, did not help to further the project. When the film opened at the cinemas there was no trace of a soundtrack album. Gabriel took his time. This was his first “real “ soundtrack, after all – the music for Birdy had been composed from recycled material, as Gabriel admitted on the cover. The Last Temptation also provided him with an opportunity to explore in even more depth the music that had influenced his albums III (Melt) and IV (Security). It was an obvious idea to use music from the region for a film that is set in the ancient Near East. Gabriel did not strive for historism but for “music that could have plausibly been made in Judaea when Jesus lived there”. His aim was contemporary music, music written today that also could have been contemporary at the time of the events in the film. One could say that Gabriel intentionally did without the usual instruments of rock and pop music. The reviewer feels it is more appropriate to say that Peter Gabriel multiplied the possibilities of expression and sounds by bringing musicians and instruments from all over the world in for the Passion recording sessions. The outcome is music that resembles the landscape in which the film is set: Barren, occasionally brittle, but never unattractive – and interspersed with lush pieces overflowing with life like the green banks of the rivers that run through the deserts of Israel. This is an album that does not want to be analysed as much as listened to with open ears – it wants to be felt. “The feeling begins very tender, very soft … until the claws dig in” – that is the very way The Feeling Begins introduces the listener to the soundscape of this album: A dark drone is the first sound to he heard. Like early dawn the doudouk lifts the veil of silence from the music. Percussion instruments come in strongly and lead the tune to a rhythmic peak. Suddenly the music breaks off and disturbing, restless flute sounds can be heard before long bass notes take over. Gethesemane is the title of the short second piece, and one can almost hear Jesus calming down after accepting the cup. A vibrating instrument turns the brooding atmosphere and introduces Of These, Hope, a joyful piece. Its title reminds the reviewer of the famous word from the First Epistle To The Corinthians: “Right now three things remain: faith, hope, and love. But the greatest of these is love” (1 Cor 13, 13). It is a light, almost dancing rhythm, with flute and violin sounds by Shankar hovering above it. The melody flows easily into Lazarus Raised. The musical setting of this resurrection is exceptionally brittle; only a simple doudouk melody rises from the barren soundscape. The melody of Of These, Love returns expressively played by a flute. There is more movement in the Reprise of Of These, Love. A slow, deep loop is the pulsating foundation for In Doubt. Distorted samples and vocals are hardly recognizable as such. As fas as the atmosphere is concerned, In Doubt resembles Ravine from Genesis' album The Lamb Lies Down On Broadway. The percussion brings in a fresh breeze as the song moves seamlessly into A Different Drum. No less than three musicians attend to the rhythm instruments. Above them, Shankar's violin and Youssou N'Dours vocals glide weightlessly as Peter Gabriel's earthy vocals come in like a mountain range slowly stretching towards the sky. Neither sings intelligible lyrics – both of them use the half-articulated pseudo-language commonly called “Gabrielese”. Both briefly unite their voices for a rhythmic interlude before N'Dours exultant cry brings A Different Drum to its end. After a moment of silence the best-known piece on this album begins. Zaar is also included on Gabriel's first Greatest Hits album Shaking The Tree. Subdued rhythms let the music flow like fresh water runs through a desert garden giving life. Soon the instruments begin a dialogue with Peter's sparse vocals before a new rhythm of guitar sounds rises and leaves the depths behind. In the end Zaar sinks back to the depths of the beginning like a long circle reaching its beginning again. Troubled is the most conventional number on this album. Samples and powerful drumming that could be found on regular rock albums, too, kick it off but soon fade back to leave Peter Gabriel and David Sancious chanting something like a mantra. The magnificent Open is a meditative dialogue between Shankar's violin and Peter Gabriel's vocals that grew out of an improvisation. A dark drone provides the background, and both voice and violin sound much brighter for it. The atmosphere chances radically as the next piece begins. The bright sound of finger cymbals that provide the rhythm for Before Night Falls is an unaccustomed one. Shankar’s double violin accompanies the ney flute that sings a delicate evening serenade originally from Armenia. Hesitant bass notes form a slow waltz beat and bring on what is probably the most accessible piece on the album. With This Love picks up on tunes from classic religious music. Oboe and Cor Anglais play melodies of Peter’s that could have been written by Johann Sebastian Bach. The main motive enchants the listener with its intense simplicity and a beauty that, to the reviewer, is almost painful. Towards the coda a synthesizer takes over and leads the main melody into a relaxed radiant finale. Sandstorm brings the listener back into the desert. From out of the sand-filled howling of the storm a dancing chant slowly emerges, only to disappear faster than it became audible. Stigmata, the musical rendition of the wounds of Christ, resembles Open. Both pieces come from a jam. Peter Gabriel and kementché player Mahmoud Tabrizi Zadeh have created a vulnerable piece with a charme less soft than that of Open. 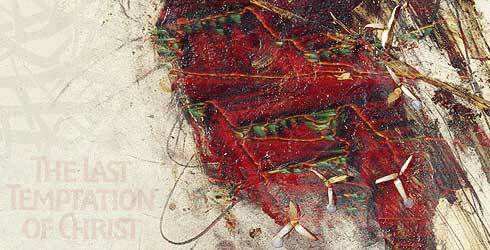 Passion is not only the longest number and its title piece, but it is also the central piece on the album. A long dark drone – a frequent trick on the album – provides the background for Shankar’s silently weeping double violin. The theme is continued by fantastic vocals by Nusrat Fateh Ali Khan, who passed on far too early. Many little elements embroider the melody through the pristine voice of a choirboy breaks its way. All in all the sound is rather muted – perhaps like the pain (represented by the qawwali vocals) dulls the perception of the surroundings, and like the knowledge that it is his mission to become the Saviour (represented by the choirboy’s voice) drive Jesus on to fulfill his task. The reprise of With This Love is sung by a very fine choir. Its almost transcendental beauty has a soothing effect after the emotional Passion. Silently, like a world in mourning, the Wall Of Breath moans out of the speakers. Ney flute, double violin and arghul fill everything and yet remain intangible. Wall Of Breath is, in fact, one of the very few songs on this album that has no rhythm instruments at all. The percussion instruments return with a vengeance in The Promise Of Shadows, running wildly through each other and playing around synthie sound that were distorted so cleverly that they sound natural. A kind of trombone fanfare closes The Promise Of Shadows. What is most disturbing about Disturbed for the Gabriel fan is not the music but that Gabriel would recycle the intro for Low Light from the Millennium Show OVO. Disturbed moves in a completely different direction, though, fast percussion soon comes in and gives a hurried, almost hunted impression. This is heightened by staccato fairlight sounds that fade out while the rhythm elements grow more dominant in the middle of the piece. A whirring sound marks the transition to the penultimate piece on the album that really begins with a kind of exultant cry. Drums and other percussion come in quickly. The melody is handed over to the keyboard that – at this place in the musical narration! – sounds like church bells merrily ringing out the message that it is accomplished. A terrific effect – the Easter message in a couple of notes. With this the musical rendition of the life of Jesus proper is over, from the moment when The Feeling Begins to the the moment when It Is Accomplished. One last piece follows, though: Bread And Wine seems to be out of the narrative order of the album, because Bread And Wine are elements of the Last Supper – which would put its place before Gethsemane. Putting the piece at the very end, however, opens a perspective that transcends the (hi)story, for today Christian still celebrate the Holy Communion with bread and wine to commemorate the Last Supper. Warm bass sounds, the double violin and Richard Evans’s tin whistle bring a very special album to its end. And while you listen to the last flute sounds you may be leafing through the booklet and realize what a homogenous album Peter Gabriel has made with musicians, instruments and sounds from all over the world. The influences range from the Armenian melody that left its mark on The Feeling Begins, a Kurdian love song (in Lazarus Raised), Egyptian rhythms designed to banish evil spirits (Zaar) all the way across the Atlantic to Brazilian percussion (Passion). It is homogenous music, but it is never monotonous or boring. It is really worth the time and effort to listen to it very carefully – and yet it has a relaxing quality. There is a special allure to it because of the way the album hovers between the religious topic and Gabriel's distance to church as an institution. He has found wonderful soundscapes, and the reviewer found much of the music moving to a degree that he is tempted to call it inspired in the literal sense of the word. However the gentle reader may think about that question, they are very likely to agree that Gabriel's debut as a composer of a film score is a huge success: Passion does not contain only music that is tied to the film as “Music for The Last Temptation Of Christ” but it is an independent work of art in its own right – and very worthwhile listening to. The artwork for the album is are sparse as some of the music. 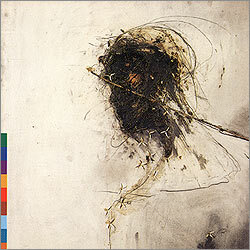 The cover shows a painting the artist Julian Grater called a “Study for Self Image”, but in the context of the album's topic it can readily be seen as a very abstract portrait of Jesus wearing the crown of thorns. The materials (charcoal, beeswax, straw and others) and the earthy brown and beige colours may remind one of the barren deserts in Israel. The back cover shows a photo of resorcinol crystals in large magnification. Its needle-like structure suggests the hills and valleys in Israel, and the dark red colour of course the blood. The reviewer does not, unfortunately, own the vinyl version of this album, so he cannot say much about what is in there. The booklet of the original CD version contains a brief (one-page) essay by Peter Gabriel about what can be found in this album. After that the tracks are listed with all the musicians involved, followed by a list of thank-you-tos, a couple of black-and-white stills from the film. The last couple pages are taken up by a note that explains the concept of RealWorld Records in English, French, Spanish, Japanese and Chinese. For this album is special for RealWorld. Its catalogue no. is RWCD1 and it is actually the first release of the new label Peter Gabriel set up. A good omen, one could say, and it proves that RealWorld Records really set out to bring world music to people with a passion.